Q: Why did you choose Coventry University? 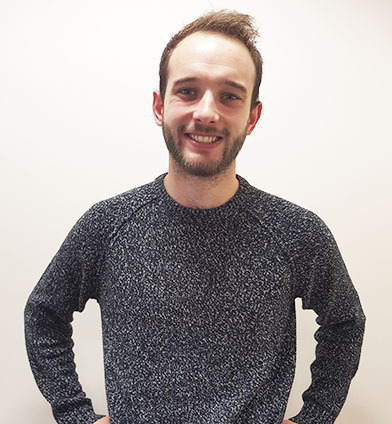 Russell (A): I started studying at another university in 2012 and went through a difficult time whilst I was there. I wanted to gain experience studying in a cinematography and photography environment but the course failed to meet my expectations. Growing up in Coventry, I had a good awareness of the university and knew the area well. I also had a friend who attended Coventry University which made me feel comfortable. A: I decided to study Media Production BA (Hons) with International Enhancement. I graduated with a first class honours degree. It was a great experience; I felt I dived straight in and got everything I wanted from the university which is a blessing. I spent a year studying abroad in Madrid and learning more about shooting video. It was amazing and definitely enhanced my student experience. Q: How did you find your experience at Coventry University? A: I felt stimulated at the university and enjoyed every minute. It’s the best decision I’ve ever made. I made a great group of friends and was around people who respected me and made me feel comfortable. It helped to boost my confidence and bring out the best in me. Q: What are the main things you gained from your degree? A: I got everything I wanted from the degree, I felt very welcome and comfortable. I have never had a group of friends, but I made a really good group of friends at Coventry. The knowledge and skills I gained from university provided me with skills that I could use. My critical approach to situations has changed, the discipline I learnt from Coventry University helped me to practically approach situations and improved my level of confidence. Q: As a recent graduate, what you have been doing career-wise? A: I’ve been working as a freelance cinematographer & photographer, which has seen me travel around the UK working on video projects for theatres such as the Royal Shakespeare Company and The Old Vic. I’ve also been carrying out photography and video work for clients and events around Coventry and surrounding regions. Before graduating I produced my debut into documentary film-making about a fellow Coventry University student and accomplished bodybuilder, which was submitted to BBC 3 Fresh Online who were searching for films made by young filmmakers about life in the UK. As of now I am developing a business plan to tackle my passion of becoming an accomplished filmmaker and photographer in the field of combat sports after spending two years developing my final major project, a sports documentary about mixed martial arts titled ‘I Will Come To Fight’. Q: What are your plans for your future? A: I’d like to focus on filming sports and athletics. I love to inspire people like athletes to become the best version of themselves. A: Stay focused and maintain an open mind. If you’re going to be closed minded you’re not going to get anywhere. Listen to your tutors and don’t leave it ’til the last minute to complete your work. International, Interviews, Join Us, Real stories, Student Life, Student Wins, Undergrad, Why Cov Uni?